Dr. Sharon Greenleaf La Pierre, Ph.D.
During Sharon’s career, she has been involved in many aspects of the educational field from being a director, board member, and teacher at various levels, as well as a Kellogg Post Doctoral Fellow at Montana State University in Adult Learning Research and a professor of Graduate Studies at Northern Arizona  University. Her research interest and  publication record have been extensive in the field of the nature of spatial intelligence. She has many publications to her name, including several books and has been an editor of many juried research publications and journal articles. Sharon has been president of several professional and international research organizations. 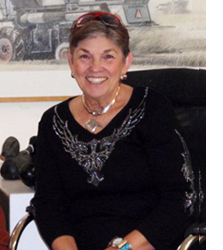 She was the Founding Chair of the Wildlife Legacy Trust Fund Serving the Community Foundation of Boulder County, Colorado. She is involved actively in a national network of rescue for animals. Her involvement with horses came through her rescue of an abused baby Peruvian Horse, Caramela de Raza. Since that time, she has shown in the blue and ridden with delight.